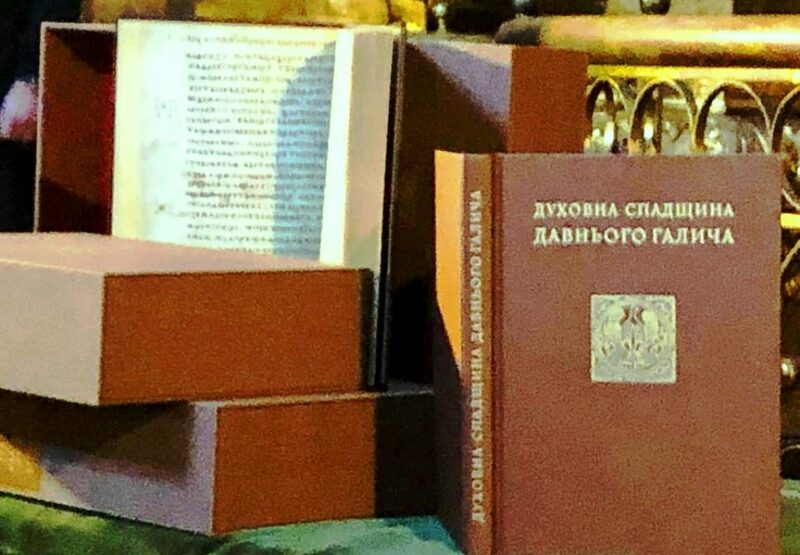 Today at Saint Sophia Cathedral, Kyiv, the presentation of the facsimile edition of the Halych Gospel of 1144 took place. The joint project of the Church, Vasyl Stefanyk Precarpathian National University and the Ukrainian Catholic University is the result of the hard work of many people and institutions. The solemn presentation was attended by the Father and Head of the Ukrainian Greek Catholic Church, His Beatitude Sviatoslav, the Director General of the National Sanctuary Complex “Sophia of Kyiv” Nelly Kukovalska, the Rector of Vasyl Stefanyk Precarpathian National University, Professor Igor Tsependa, the First Deputy Chairman of the Supervisory Board of Vasyl Stefanyk Precarpathian National University, the manager of the Project “Halych Gospel of 1144” Igor Oliynyk, the Director of the Center for Medieval Studies at Vasyl Stefanyk Precarpathian National University Miroslav Voloshchuk, the Director of the Ukrainian Catholic University Publishing House Volodymyr Netak, the Vice-Rector of the Three Saints Kiev Theological Seminary, Priest, Doctor of Biblical Theology Roman Ostrovsky, the Head of the “Printing Museum” of Borys Voznytsky Lviv National Art Gallery, Vira Frys (Ph.D.), the Coordinators of the Research Program “Kyiv Christianity” Professor Igor Skochylias and Priest, Doctor of Biblical Theology Roman Zaviyskyy. For the Ukrainian Christians this is a historical event, and therefore it is rather symbolic that the publication of the Halych Gospel was presented exactly in the cradle of Kyiv Rus. The project became possible under the blessing of the Head of the Ukrainian Greek Catholic Church, His Beatitude Sviatoslav and the financial support of Igor Oliynyk, the First Deputy Chairman of the Supervisory Board of Vasyl Stefanyk Precarpathian National University. In his address, His Beatitude Sviatoslav thanked Vasyl Stefanyk Precarpathian National University for the great help in implementing the project and emphasized the common heritage of this unique publication, confirmed be the presence of the Orthodox hierarchs at the presentation. The University Rector, Professor Igor Tsependa noted that the Ukrainian Catholic University and Vasyl Stefanyk Precarpathian National University did not accidentally engage in this important project. “Both Universities have great experience in conducting fundamental researches,” he said. “It’s a great honor and gratitude to those people, benefactors and patrons who manage to save and restore such memorable historical memorials. After all, our nation stands on three big whales – it’s language, spirituality and cultural heritage,” said Nelli Kukovalska, the Director General of the National Sanctuary Complex “Sophia of Kyiv”. In his turn, Igor Oliynyk, the First Deputy Chairman of the Supervisory Board of Vasyl Stefanyk Precarpathian National University, the manager of the Project “Halych Gospel of 1144”, thanked everyone who participated in the creation of the facsimile edition of the Halych Gospel and presented the first copy to the Head of the Ukrainian Greek Catholic Church, His Beatitude Sviatoslav.